Throughout his time in the NBA, people have been looking for the perfect rival for LeBron James. At first, it appeared that Kobe Bryant would fit this mold. Then, the media was quick to build up a potential rivalry with Kevin Durant as Durant was developing into one of the league’s best players. Of course, the matchup between the two in last year’s NBA Finals played into this. With this being said, a clear cut rival hasn’t quite emerged for LeBron. This is fine, and part of this is certainly the media trying to create hype. When asked who his biggest rival is, LeBron James had an interesting answer: Paul Pierce. This makes sense, as the Boston Celtics for a little while were the team that LeBron could never seem to get by, particularly while he was a member of the Cleveland Cavaliers. Also, James and Pierce had an epic battle in the Eastern Conference Semifinals the year the Celtics won the championship. James is clearly the better player, but Pierce has always found a way to step up his game when the two square off. Obviously, players such as Durant and Bryant are closer to being on LeBron’s level. However, LeBron has never faced Kobe’s Los Angeles Lakers in the playoffs, thus making it hard for them to be true rivals. Prior to last year, the same could be said with LeBron and Durant. The Miami Heat clearly dominated Durant’s Oklahoma City Thunder in the process of winning a championship, making it hard to call Durant a true rival. It’s probably safer to say that the Boston Celtics as a whole were LeBron’s greatest rival in the earlier parts of his career, including Ray Allen, Kevin Garnett, and Rajon Rondo along with Pierce. 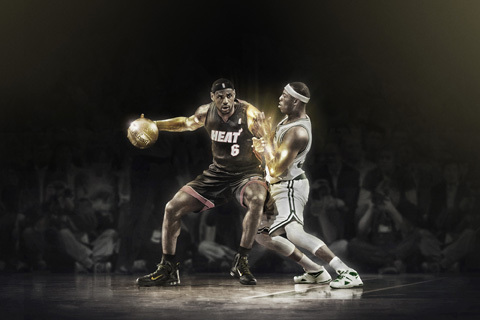 Even as recently as last year, it took LeBron’s Heat a full seven games to knock Boston out of the playoffs. With Pierce being the leader of most of these teams, it’s not too much of a stretch to indirectly call him LeBron’s closest rival. Looking forward, one would have to believe that Kevin Durant is the most likely candidate to become LeBron’s rival. The Thunder and Heat look fit to arrive in the NBA Finals multiple times over the next few seasons, possibly setting up some more battles between the two. Additionally, it appears that James and Durant will be the top two players in the league for the foreseeable future. For now, this is a huge compliment for Paul Pierce. When the best player in the world talks about you like this, you must be doing something right. This entry was posted in Uncategorized on June 6, 2013 by mannyman1998. Should the C’s gamble and sign Greg Oden ? Ok I think the #1 team need for the C’s is a center, preferably a young and talented one. Now Ainge met with Greg Oden last year ( who is just that a young and talented center) so it would seem both sides may have interest in each other. Now the word is Oden has looked great working out in recent months and appears healthy, so the question is should the C’s gamble on trying to sign him, if he could be acquired at a decent price? I think if Ainge could sign Oden to a decent contract, it would be a low risk and possible very high reward move, so I would do it. Rondo, Bradley, Oden, KG (I hope he moves back to the 4) and Green ( I hope he starts) as starters. Randolph (as our back up 5) off the bench. Then to finish off the roster the C’s could have Melo & our draft pick this year if not traded away ( I am hoping for a another big to be drafted, either Withey, Dieng or Adams if possible would be great) to add additional big man depth and to develop as additional bigs to either utilize down the road or use as trade bait to help acquire another team need. I think the roster above would be very competitive and would be a team that could make a solid run for a title next year, if everyone stays healthy ( especially Oden ) and it would be a team with Oden on board that would be in much better shape to rebuild for the future also, which would be like killing 2 birds with one stone. Greg Oden is a young and talented center, exactly what the C’s are in dire need of at the moment and if he can stay healthy, I think it could be a big time game changer both short term next year and long term for years to come for the C’s which who help get them back in contention for a title again sooner , rather then later. So for the reasons above, I think it would be worth the gamble signing Oden, if the opportunity is their at the right price and especially if the C’s think they can not acquire any other young and talented center this offseason the caliber of Oden. But thats just my take and I would be interested in having others give me their opinions on the matter, so have at it. This entry was posted in Uncategorized and tagged Greg Oden, National Basketball Association on June 6, 2013 by mannyman1998. 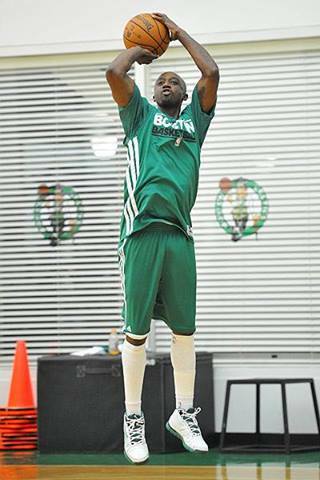 Jason Terry, as it turns out, was not running on two healthy legs by the end of the season. The Celtics guard, who tweeted a picture of himself running on a treadmill in the Celtics’ Waltham practice facility yesterday, had an arthoscopic procedure to remove the plica from his left knee. The plica is described as an extension of the protective synovial capsule of the knee, and can become irritated, enlarged or inflamed if caught between the patella and the femur.